Beautifully engraved SPECIMEN certificate from 3Re.com. This historic document was printed by the Security-Columbian Banknote Company and has an ornate border around it with a vignette of the 3Re.com company logo. This item has the printed signatures of the Company's Chairman and Secretary. 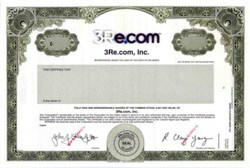 3Re.com was founder and pioneer of returns management and was the service industry's first independent hub based depot repair and return operation. Over the span of 12 years 3Re was the outsourced returns operation for many of the largest manufacturers and retailers. These clients* included Apple, Brother, Dell, Compaq, Canon, Lexmark, IBM, HP, Okidata, NEC, Fujitsu, Micron, Texas Instruments, Toshiba, Logitech, Woolworth, InFocus, American Express, and Concord EFS among others. Death of A Dot Com: In 1998 3Re launched its online efforts to remarket the OEM's returned products under its own brand name 3Re. In the early days of dot coms 3Re competed with companies like Value America, and Buy.com who were selling new products well below cost to drive site traffic. Additionally the timing of the 3Re e-commerce launch of a major infrastructure model was counter productive to where the industry was being created with virtual companies less warehouses and infrastructure. By September of 2000 the marketplace had collapsed and dot coms began to fail. With a capital-intensive model to purchase inventory and create an online brand, 3Re was unable to secure C round funding and filed for chapter 7 in July of 2001.